Attached is an annotated crop of a hipassed cylindrical map rendered with 360 pixels per planetocentric degrees. Annotations indicate what I'm inclined to see. A mostly smoother area north of 22°N contrasts the rippled area south of 22°N. The wavelenghts of the ripples seem vary around 100'' to 160'' longitude. Longitudes to be corrected by 180 degrees L3. There appear to be subtle, but widespread waves in PJ12, #087. This is remarkable, since they are about 20 degrees north. planetocentric. The attached image is a crop of an enhanced reprojection, not a map. I've added links to PJ-08, and PJ-09 maps in the site linked to in the previous comment. In PJ-09, image #088, there is a narrow, but distinct mesocsale wave train, a little south of the equator. 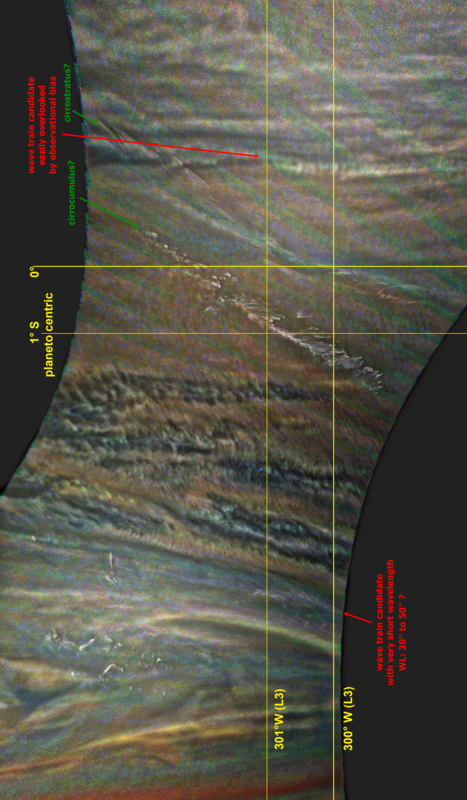 On the following site, I've provided cylindrical maps of PJ11 RGB images with a resolution of 180 pixels oer planetocentric degree, and from 15 degrees south to 15 degrees north. I'll add similar maps of other perijoves to the same site as time allows. 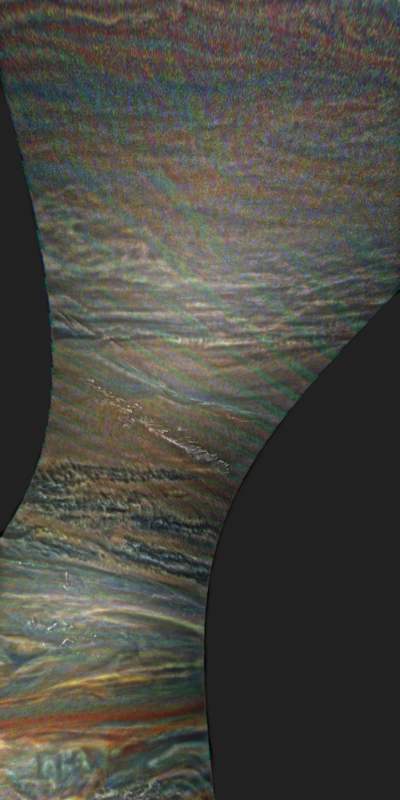 I tried to animate enhanced crops of the PJ11 maps, but with the residual distortions, there is significant wobbling making it difficult to see actual motion of the waves.